Drama? Raise the stakes. Family drama? Raise the stakes. Family melodrama? Raise the stakes. Courtroom family melodrama? Hold on now — you’ve gone too far. The heart of The Judge, a thick yarn from heretofore comedy-focused director David Dobkin, is the slow reparation of an estranged father-son relationship. 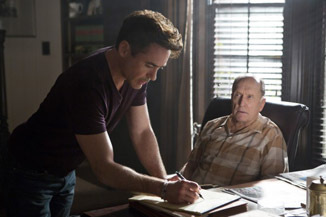 Joseph Palmer (Robert Duvall), a no-nonsense, small-town judge, did not spare the rod with his middle son, Hank (Robert Downey, Jr.) When Hank caused a car crash that ended the baseball career of eldest brother Glen (Vincent D’Onofrio), their relationship was severed; in a mix of homage and spite, Hank became a slick defense attorney. Hank reluctantly returns home to attend his mother’s funeral, and finds no harbor with the old man. Then Joseph turns up with a banged-up car he can’t explain — and the police find a body. Looks like someone needs a hotshot lawyer, whether he likes it or not. Thus begins a fairly deft, if utterly implausible, journey towards an inevitable climax — the airing of the family laundry in open court. The legal proceedings are the truly compelling stuff; despite the central relationship, we’re really there to hear the verdict. Which isn’t to say the performances don’t resonate; ridiculous though the circumstances may be, any excuse to get Duvall and Downey playing off of one another is fine. And the film’s other key head-to-head, between Hank and prosecuting attorney Dwight Dickham (Billy Bob Thornton), is juicy enough as well. Unfortunately, The Judge takes itself far too seriously for its somewhat sensational story. The emotion is patterned after the likes of August: Osage County, a clear influence — the confining effects of small-town America forcing the unearthing of secrets, the disconnect between love and reality, the altering of expectations. These are rich themes; after all, plenty of films have used them. But most of those movies don’t force their principles into a climax that would feel out-there on a network legal drama. And the less said about a pair of deadly subplots the better.